Presented by Red Brand Fence. Mike Penna and Jude Feld broadcast live from Keeneland Racecourse. Special guests include Trainer George Weaver, Paige Albarado, co-owner of Kathleen and Keegan Millinery, and our Industry Star of the Week brought to you by Stuart Morris, Conor Foley of Oracle Bloodstock. 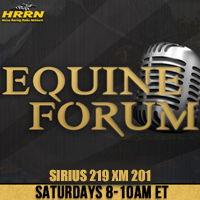 Plus We handicap Saturday's stakes races at Keeneland, Aqueduct and Santa Anita with our duo of experts, Michael Hernon from Gainesway, and John Gasper.